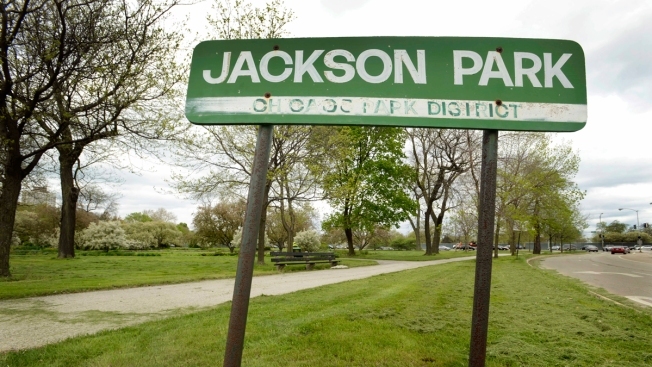 Vehicles pass by Jackson Park in Chicago, May 12, 2015. The head of President Barack Obama's foundation announced that Chicago's South Side will be home the Obama Library. The park is one of two Chicago parks picked for the future presidential library. Despite its “dismay” at the use of existing Chicago parkland for President Barack Obama’s presidential library, Friends of the Parks said it will not sue over the building of the new center. “Friends of the Parks’ analysis suggests that there is no realistic legal remedy at this time to protect this public open space from this development,” Executive Director Juanita Irizarry said in a statement. Concerns about a potential lawsuit first sprouted earlier this year, when Mayor Rahm Emanuel suggested the legal battle over the Lucas Museum could be a preview for the Obama Library. "In about two months, hopefully, the president of the United States will pick -- because it could have been in New York, Chicago -- and he will either pick Jackson Park or Washington Park for his library," Emanuel said at the time. "Jobs, economic development. Either one of those are Olmsted parks. God willing, there won’t be a lawsuit." The library will be home to Obama's archives and a museum about his presidency, and is expected to be completed in 2020 or 2021. Emanuel called the project a "unique opportunity" for Chicago and advocated aggressively for the selection. The Barack Obama Foundation recently announced that the New York architects behind the nearby University of Chicago's Logan Center for the Arts would partner with a Chicago firm in designing the center. The group said it has worked with Obama in the past and plans to be involved in the design and development of the new library.